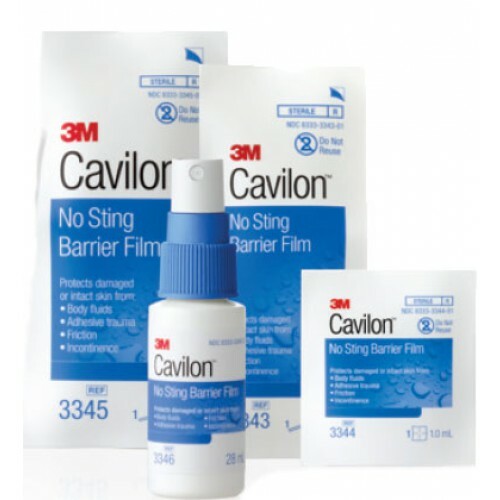 3M Cavilon No Sting Barrier Film is a dry skin lotion that protects damaged, sensitive skin from body fluids, friction and adhesives. This fast-drying, alcohol-free liquid barrier film forms a breathable transparent coating on the skin, protecting wounds and ostomies from dangerous moisture buildup and body fluids. This dry skin lotion is non-sticky, hypoallergenic, non-cytotoxic and will not sting even when applied to damaged or denuded skin. It comes in several application types: Cavilon Barrier Spray, packaging wipes and foam applicator. 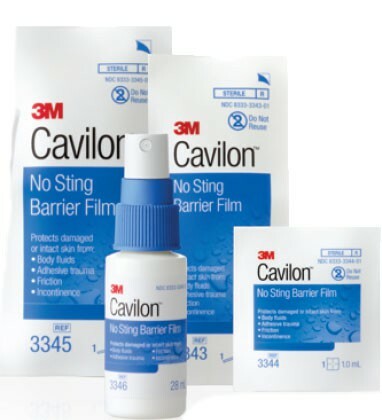 3M Cavilon No Sting Barrier Film is designed with a unique 3M terpolymer that forms a breathable, transparent protective barrier film on the skin that dissolves smoothly into a solvent system. If you're searching for a fast-drying, non-sticky protective film, look no farther than this breathable, skin-protecting no-sting Cavilon Barrier Film. You may also be interested in similar barrier film products, such as Aloe Vesta Protective Barrier Spray. This item is designed for protection against incontinence related rashes. So, it will help to protect from a diaper rash. The Cavilon Brand was used in the hospital and after home health stopped I bought the wipes. My husbands skin is very sensitive and this works better than any we have used. Convenient to use, a lot of product on the pad to use more than one swipe....excellent product! No sting and protects skin. Spray bottles are convenient. I love the Cavilon film barrier as they protect my husband's skin and make for better appliance changes. The wands work for us because I can apply it just where it needs to go. With several bandage changes a day a good high quality easy to apply film on the skin is necessary. This does the job. Works much better than other barrier films I have tried. Used with ostomy powder and neosporin to assist with healing and sealed beautifully. The 3M barrier wipes are the best. We've tried larger wipes and other brands and have had problems with either waiting for the stuff to dry or having issues with the ostomy products sticking to the surface. This 3M product works the best. good product to use on exposed skin areas subject to breakdown.